During the 18th and early 19th centuries, coal-fueled cast-iron ranges were the most popular and economical method of heating both food and the room they were in. However, such ranges needed daily maintenance. 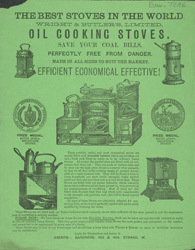 Less work-intensive alternatives, gas and oil cooking stoves were available from the 1860s. They were not immediately popular because they were relatively expensive and didn’t warm the room, but they were persistently recommended by contemporary housekeeping books and by the early 1900s were much more common.